The journey of our lives is sometimes filled with hurdles and challenges that at first seem to be overwhelming. I was 30 years old with two small children when my first husband died. That event became a benchmark for me, a call to measure up. Overcoming deep sorrow, fear, and loneliness is a daunting task. 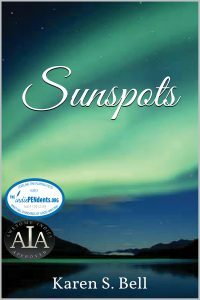 In my novel, Sunspots, I tried to capture this heartache and to also present the hope and eventual attainment of a fulfilling life. The story is fiction but the feelings are real and writing this book became a catharsis for me. I have always been attracted to the unknown energies around us that sometimes make themselves known. Mystical elements that help us shoulder on. Sunspots incorporates those elements in the narrative. As in all my work and because I write in the first person, my characters are a version of myself and a composite of people I know or imagined from old family photos. Sometimes they just spring up from my unconscious and give me their names, like the ghost of Viola Parker. The creative process is magical and I just go with it. I took a bath. I needed to cleanse myself psychically as well as physically. As I washed, I thought about what Owen said concerning Viola Parker. Thinking of Owen nauseated me and made me feel quite guilty so I switched my concentration to Viola Parker…my ethereal intruder. Funny he should say what he did—like he knew her or of her. I couldn’t figure the connection because she was quite old and, as far as I could discern then, not related in anyway to Jake’s family. Her name had never come up in any conversations, or her existence. So I wondered why Owen thought it odd that I bought her house after she died. But I was sure, Viola Parker herself would reveal her past to me because…she never really left here, never gave up claim to this place. Shockingly, startlingly, Viola just started showing up, rocking away in that old chair and grinning at me like the Cheshire cat in Alice in Wonderland. She rocked and rocked in that damned chair or Chair of the Damned, as I like to call it. And I was not happy about it. My aversion to Viola’s corporal presence and ethereal spirit might seem odd given my desire to make contact with Jake but I knew nothing about her. She could have been a crazy person in life and be a slasher-type in death like Nightmare on Elm Street’s Freddy. So, naturally, I was cautious. At first, I thought I was hallucinating. I had placed the chair in the living room right near the fireplace. It looked smart there. It was not a fancy rocker, just plain wood with a worn seat cushion but it had character like an antique. Could have been from JC Penny for all I knew about antiques but it had the look. I never sat in it because that worn seat suggested its heavy use by a now dead Viola Parker and that was creepy. I decided I would sit in the chair when I got a new cushion, but I was too busy studying and being a mentally disturbed hermit to refurbish anything. The encounters began one night after dark (naturally), exactly one week after my mother left. The chair started rocking by itself. I was walking in the hallway and threw a glance into the living room. The chair had rocked. There was movement. I stopped to catch another look. The chair was still. I looked away and then sensed a one-two rock. I was intrigued and freaked out so I went over to the now stationary chair and felt around for a shot of air or any other logical disturbance. I manually rocked the chair but there was no explanation. I decided that sleep deprivation had distorted my accurate assessment of rocking versus not rocking so I went to bed to get some much-needed rest. The next night the same thing—edge of vision rocking—straight on looking no rocking. This went on for five nights and I decided to throw out the chair. I took it out to the street for pick up and watched the truck drive away with the chair in its bowels. But my intuition or premonition did not give me a peaceful feeling as I watched the truck drive out of sight. With dread, I walked back into my house and sure enough, there was the chair.